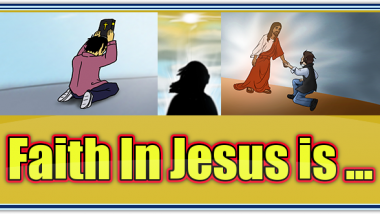 When a person decides that Jesus is the Savior of the world accepting Him as their Savior, they become born again and 100% receive the gift of Righteousness. This gift empowers some Christians throughout their Christian life to live bold fearless lives with rich enjoyment. Romans 5:17 tells us that by the abundance of Grace and the gift of Righteousness we shall reign in life by Christ Jesus. Only empowering some Christians? All Christians will and are established in Righteousness, some just don’t activate it’s blessings by using their faith in the Righteousness of Jesus with which they are established. Why is it that only some Christians seem to reign in life and others seem to be oppressed and fearful? Isaiah 54:14 is saying when a person knows and are established in righteousness they have the benefits of reigning over fear and oppression. They speak these things into reality because they believe in Jesus’ Righteousness as a gift. Every Born Again Christian is given the gift of Jesus’ Righteousness but not all of them establish their selves in this gift. Instead they try to establish their self in their own righteousness and merits. Establish is related to the word stable through its Latin roots and has many meanings like; to build, to start something, being stabilized, etc… but all have the feel of building on a stable foundation. 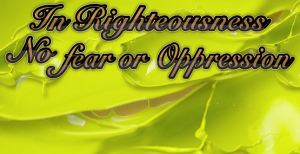 Since every Christian has the free gift of Jesus’ Righteousness and God’s unmerited favor (Grace), if it was automatically applied to their lives there would be no Christians who were oppressed or fearful. But since this is not the case, you must be established in His Righteousness to build the foundation of this gift of righteousness in your life with stability and truths from God’s Word. …,how much more will those who receive God’s abundant provision of grace and of the gift of righteousness reign in life through the one man, Jesus Christ! We can reign in life by first getting the abundance of Grace in our daily walk with God. Lets face it, we couldn’t save ourselves and that is why Jesus came. Lets not venture off from that becoming a “Do it Yourself Christian” and lets be established in the unmerited favor of God’s Gift of Righteousness. We need to learn why the Bible says it is by faith that it might be by Grace (Romans 4:16). Then understanding that Grace comes by faith we need to build our faith. Romans 10:17 says faith comes by hearing the word of God. As we build our faith by hearing God’s Word we begin to become established in Jesus’ Righteousness that we already had and we will see fear and oppression begin to dissipate. Some reign 30 %, some 60 % and some 100 % in established righteousness (Matthew 13:8). As we continue to feed on God’s Word we move from being a 30 fold receiver to a 60 fold receiver and then 100 fold in in receiving God’s unmerited Favor through our ongoing lives on earth. The process is not something where you have heard God’s Word, but the process is continued hearing that brings the faith needed to establish His Gift of Righteousness in our lives. 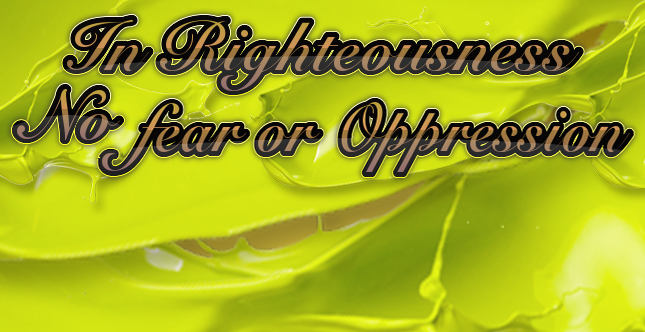 Beloved, fear and oppression cannot continue to bother the Christian who is established in Righteousness. To be established in Righteousness you believe that you are righteous by faith having received Jesus’ Righteousness as a gift and because of that God’s Grace (unmerited favor) is extended to you. God gave us the gift of righteousness for us to reign in life by Jesus, not our right actions. We have nothing to fear reigning in life with an abundance of Grace and the Gift of Righteousness.